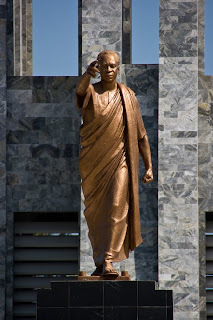 The first African statesman to achieve world recognition, Kwame Nkrumah (1909-1972), became president of the new Republic of Ghana in 1960. He campaigned ceaselessly for African solidarity and for the liberation of southern Africa from white settler rule. His greatest achievement was to win the right of black peoples in Africa to determine their own destiny. "In order to halt foreign interference in the affairs of developing countries it is necessary to study, understand, expose and actively combat neo-colonialism in whatever guise it may appear. 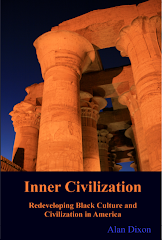 For the methods of neo-colonialists are subtle and varied. They operate not only in the economic field, but also in the political, religious, ideological and cultural spheres. While capital worth $30,000 million was exported to some fifty-six developing countries between 1956 and 1962, ‘it is estimated that interest and profit alone extracted on this sum from the debtor countries amounted to more than £15,000 million. Still another neo-colonialist trap on the economic front has come to be known as ‘multilateral aid’ through international organisations: the International Monetary Fund, the Inter-national Bank for Reconstruction and Development (known as the World Bank), the International Finance Corporation and the International Development Association are examples, all, significantly, having U.S. capital as their major backing. These agencies have the habit of forcing would-be borrowers to submit to various offensive conditions, such as supplying information about their economies, submitting their policy and plans to review by the World Bank and accepting agency supervision of their use of loans. Neo-colonialism is not a sign of imperialism’s strength but rather of its last hideous gasp. It testifies to its inability to rule any longer by old methods. Independence is a luxury it can no longer afford to permit its subject peoples, so that even what it claims to have ‘given’ it now seeks to take away. Bolstered with ideological clarity, organisations, closely linked with the ruling parties where liberatory forces are in power, will prove that neo-colonialism is the symptom of imperialism’s weakness and that it is defeatable. For, when all is said and done, it is the so-called little man, the bent-backed, exploited, malnourished, blood-covered fighter for independence who decides. And he invariably decides for freedom." 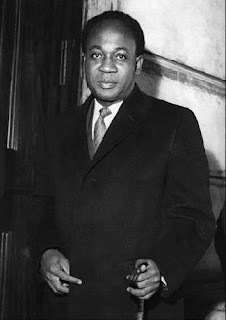 Just four months after the release of his book on neo-colonialism, Nkrumah was overthrown on Feb. 24, 1966, by a coup d’etat led by lower-level military officers and police in Ghana while he was away on a state visit to Vietnam. Declassified National Security Council and Central Intelligence Agency documents exist providing evidence of United States government involvement in the overthrow. 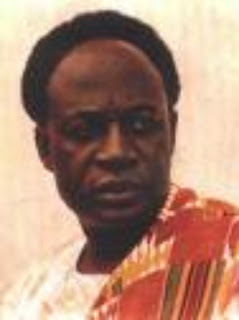 (See http://www.seeingblack.com/x060702/nkrumah.shtml). 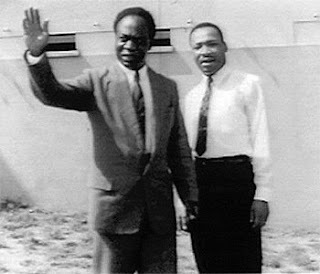 Following this, Nkrumah would never again return to Ghana, but nevertheless he continued to push for his vision of African unity from elsewhere. In particular he spent much of his exile in Conakry, Guinea, where he was the guest of Ahmed Sékou Touré, who made him honorary co-president of Guinea. He spent his time reading, writing, corresponding, gardening, and entertaining guests. 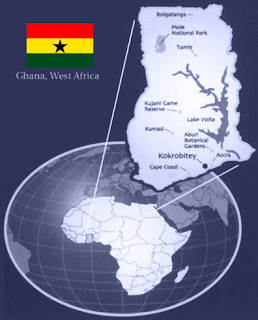 "Divided we are weak; united, Africa could become one of the greatest forces for good in the world...I believe strongly and sincerely that with the deep-rooted wisdom and dignity, the innate respect for human lives, the intense humanity that is our heritage, the African people, united under one federal government, will emerge not as just another world bloc to flaunt its wealth and strength, but as a Great Power whose greatness is indestructible because it is built not on fear, envy and suspicion, nor won at the expense of others, but founded on hope, trust, friendship and directed to the good of all mankind." Great info, ASD. Didn't know that about the JW's. Everybody's got the propaganda game and allowed to put into motion except us. Well, we put it into motion against our own people. The greatest African leader since the 19th century. The singular greatest threat to the west, which is why he was eliminated. West Africa would have been a much better place if we had leaders like him, unfortunately current "leaders" are blindly taking us back into the state we were being liberated from.